A growing number of studies and surveys highlight the health benefits of knitting and crochet. A variety of books have been published on the topic. Videos capture personal stories from knitters and crocheters alike who credit the crafts for improving their wellbeing. Please enjoy the following resources for learning more about how knitting and crochet are positively affecting the health of people around the world. A Craft Yarn Council research survey of 3,100 subjects found stress reduction in 85% and mood improvement in 68% of the group. It also revealed a whopping 93% of knitters and crocheters reporting the crafts gave them a feeling of accomplishment; 56% a sense of confidence; 43% better concentration; 27% better problem solving; and 23% increased memory. A study from the Mayo Clinic for the America Academy of Neurology that reports a 40% reduced risk of memory loss in those who knit. A study at MedStar Georgetown University Hospital conducted by two oncology nurses with the help of Project Knitwell concluded that knitting can help reduce compassion fatigue (burnout) among oncology nurses. 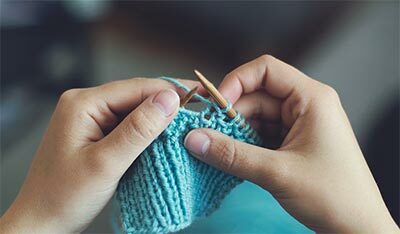 A study from Mayo Clinic Professor of Neurology and Psychiatry Yonas Geda reported in the Journal of Neuropsychiatry & Clinical Neurosciences showed doing crafts such as patch-working or knitting during middle age, combined with watching less TV, decreased the odds of later cognitive impairment and memory loss by 30-50%, and promoted the development of neural pathways. A study in The Journal of Eating and Weight Disorders shows 75% of anorexia nervosa patients taught to knit reported calming aspects and lessened intensity of fears and thoughts. A Harvard Medical School Study led by Founder of the Benson-Henry Institute for Mind Body Medicine, Dr. Herbert Benson, found that the repetitive motions and focus of needlework elicit the famous relaxation response (a calming, meditation-like state that causes heart rate and blood pressure to fall). Therapeutic Knitting Pioneer Betsan Corkhill is part responsible for a study of more than 3,500 knitters from 39 countries published in The British Journal of Occupational Therapy that found 81% of respondents with depression feeling happy after knitting and more than half feeling "very happy." She also founded a weekly knitting group at The Pain Clinic at the Royal United Hospital, Bath (running since 2006) where it’s been observed by Clinical Psychologist Dr. Mike Osborn that “knitting can help patients where nothing else does,” and launched Stitchlinks.com, a hub for individuals and healthcare professionals interested in therapeutic knitting as a healthcare tool. A survey of 4,000 knitters from global fashion brand Wool and the Gang found 90% of knitters agreeing that knitting decreases anxiety levels and 40% saying it helped to fight depression. The survey also revealed 88% of knitters feel less stressed when they knit and 70% feel a sense of happiness after tackling a difficult project or knitting technique, which helps explain why 90% of US knitters and 86% of UK and European knitters said they ‘grab their knitting needles’ after a long stressful day. Alongside meditative hobbies such as yoga and meditation, knitting and crochet were in the top Google ‘how to’ searches of 2014 with a 70% increase from 2013. The Truth About Knitting and Crochet… They’re Good For You! is a revealing article written by Leslie Petrovski that summarizes years of surveys of hundreds of thousands of knitters and crocheters about why they enjoy these crafts. Consistently over time, stress relief ranks at the top, along with creative fulfillment. A growing number of studies have been completed and articles written about the benefits of knitting and crochet to one’s mood, mind and even the body by treating symptoms of some diseases, which are summarized and highlighted along with personal interviews in this article. Knit For Health & Wellness authored by Therapeutic Knitting Pioneer and Former NHS Physiotherapist internationally recognized for improving wellness and managing illness, Betsan Corkhill, reveals how knitting may help the brain. It looks at the innovative use of knitting as an accessible, portable tool which gets people actively involved in their health and wellbeing and showcases how they can do this anytime, anywhere. Crochet Saved My Life is a non-fiction looking at the mental and physical health benefits of crochet and the research that has been done into the healing benefits of needlework. In it, author Kathryn Vercillo shares her own story of dealing with lifelong depression and the role that crochet played in finally healing from that. She interviewed nearly two dozen women who shared their stories about healing through anxiety, PTSD, post-partum depression, chronic pain and a variety of other conditions. Hook to Heal authored by Kathryn Vercillo who also wrote Crochet Saved My Life is a set of approximately 100 creativity exercises designed for people who crochet to use the craft to improve their lives in myriad ways. 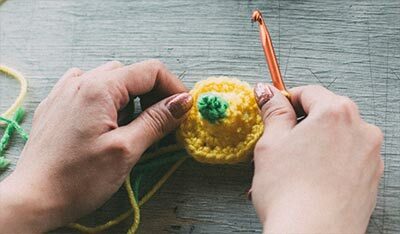 It covers a range of topics, including using crochet for mindfulness practice, improving relationships through crochet and honoring your inner artist with crafting. Project Knitwell Presents The Comfort of Knitting is a unique how-to-knit book focusing on helping families and caregivers alleviate stresses such as anxiety, sadness, and fatigue. Project Knitwell is a nonprofit organization that aims to bring the joy of knitting to people facing difficult situations. Love in Every Stitch: Stories of Knitting and Healing is an inspiring book by master knitter, teacher, and widely published knitwear designer Lee Gant who shares diverse real-life stories about women, men, and teens who have experienced profound change and enlightenment through knitting and crochet. From a suicidal teenager who crochets through pregnancy to a dying woman who finds comfort in the company of knitters, and a woman going blind who realizes she can still knit – and experience life – the stories illustrate how each stitch and purl can comfort and calm, heal and renew. Changing Global Health One Stitch at a Time features interviews with a wide range of people from older adults to grammar school kids who share their personal experiences with knitting and crochet. It also highlights the growing number of studies and articles that touch on the topic of the health benefits of knitting and crochet. Stitch Away Stress with Knitting and Crochet showcases personal stories from a variety of subjects dealing with an assortment of issues and stresses about how knitting and crochet provide them with a relaxing calm.